Time for another book review. As I am sure you are all well aware the party season is well and truly upon us. But do you cower away from such social occasions or embrace, decorate and enjoy!? With this question in mind I was very grateful to receive a copy of Parties That Wow by Jonathan Fong from GMC Publications. 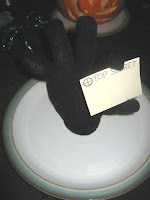 This book is filled with so many gorgeous ideas for a party theme that it is hard to choose, but being as our party was instead of a Halloween party I let the children decide and they wanted a Spy Party! In truth our party took ideas from two themes detailed in the book, elements which we thought worked well together to create the look we wanted. The end result? Our Top Secret place settings. We couldn’t leave James Bond out of the proceedings so he very kindly decorated our Pumpkin (big thanks to my husband and his rather excellant carving skills here). A UV light reveals what was hidden on the place cards (this caused a lot of fun and giggles as everyone found their places). Would I recommend this book? Yes I would. It’s a great source of ideas and inspiration for all year round events. 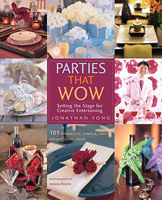 The author Jonathan clearly goes above and beyond for his party guests and even if you can’t completely replicate all his ideas they are a great starting point. Could it be improved in anyway? Yes I think it could. Unfortunately not all the themes have the same depth of instructions or ideas, some are perfect others a little shallow I felt. I would also suggest that some of Jonathan’s ideas would be hard to reproduce, so perhaps a few alternative suggestions. I also would have liked to see some ideas for themed food, although the author does admit that he is no cook. But overall I loved the book and can’t wait to plan my next event!